Small Size: 11 inch. Mark Roberts Fairies Limited Edition Spring Collection, Irish St Patricks Day Spring Fairy Limited Edition Spring Collections. 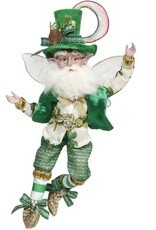 Irish St. Patrick’s Day Decorations and Decor.